Recognizing that tourism was something of an orphan in the economic development picture here, Knowles and fellow staffer Katie Hannon put together a proposal for Tourism Atikokan in 2015. It called for the development of a new community branding (which was later developed by a Thunder Bay firm, Atikokan… Naturally Wild), and a strong on-line presence that would attract visitors to Atikokan. They then went to the regional tourism organization (Tourism Northern Ontario), the Town, and the AEDC and secured $40,000 in funding. Since the first website launched in late 2015, VisitAtikokan.ca has reached almost a million people, generated over 300,000 shares, likes, and comments, and drawn over 70,000 video views. “This is people from all over the world – everywhere but Antarctica,” said Knowles. The awards were presented at EDCO’s 60th annual conference in Toronto February 9. 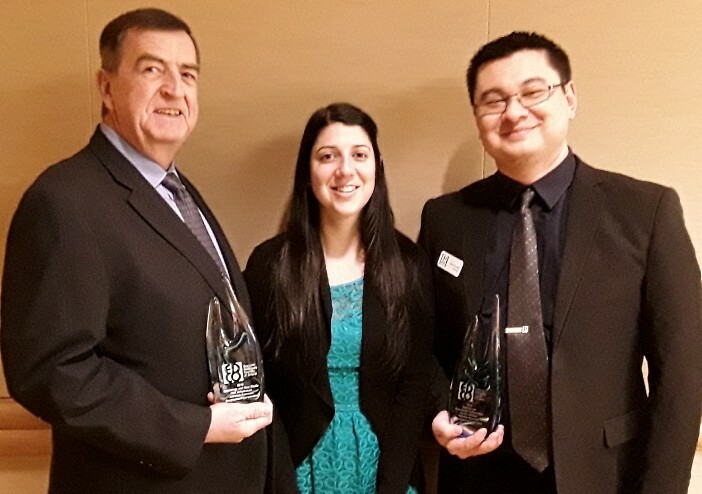 AEDC’s Garry McKinnon, Katie Hannon and Gord Knowles displaying the two Economic Developers Council of Ontario (EDCO) 2016 Awards of Excellence received for their Tourism Atikokan initiative. The awards were handed out during the EDCO Annual Conference in Toronto, Ontario in February 2017.